Here is a gem of a hike that is fairly untraveled. The trail begins off Forest Road #48 out of Packwood. There is an alternate route for horses a little further up Road #48. The trail climbs a bit through a fairly dense forested area before converging with the alternate horse trail. A short while later the trail becomes more exposed and you can see past the trailside forest to Angry Mountain and South Point. 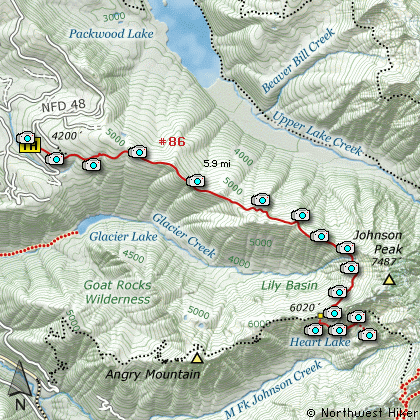 Basically, the trail follows a ridgeline, west to east, toward Johnson Peak. Sometimes the trail is on the south side of the ridge, and sometimes it is on the north side. About half way to the Lily Basin junction to the Angry Mountain trail, the views to the north and northwest become more available and you are able to see Packwood Lake below you and Mt Rainier to the northwest. Then views of Johnson Peak become more and more frequent until the trail actually turns south along the very base of Johnson Peak. In early summer this part of the trail can be very difficult due to the snow filled gullies. The run-off water creates tunnels beneath the snow, and the trail crosses over these tunnels. This can be dangerous, so use great caution. By the end of July the trail is usually clear of major snow challenges and the summer floral display is in full swing. This is why people hike this trail.... to see the fantastic wildflower displays in Lily Basin. After the junction with the Angry Moutain trail, the Lily Basin trail descends below a large cliffy area as it makes its way above Heart Lake. There is a fine trail down to the lake and ample areas to camp. One of the extraordinary benefits of hiking this trail is the high likelihood that you will see mountain goats. The day I photographed this hike we say a large herd of over 40 individual goats. One can scramble up Johnson Peak, but extreme caution is a must and good footing is a challenge. Travel east on US Hwy 12 for about 48 miles to Randle. From Randle travel east on US Hwy 12 for about 13.3 miles and you will pass the junction with	Forest Road 21. Continue on for another 1.2 miles and you will come to the junction of Forest Road 48 on your right (east). Turn east onto FR48 and follow this road uphill for about 10.8 miles and you will come to the trailhead and parking area for this hike.